Even though we had tons of snow over the winter, spring rains have not been able to keep our water table bubbling over. The Cheat River is struggling to fill its Class IV-V rapids with water. But that doesn’t mean that Class V whitewater can’t be found. The Upper Yough has a wonderful dam-release schedule, guaranteeing us water ALL YEAR LONG! The release schedule might require you to alter your plans slightly, but trust me when I say it is well worth it! The Upper Yough is a nine-mile stretch of intense whitewater. It starts with a couple miles of the Warm-Ups. The Warm-Ups give you, your guide, and your crew a chance to find your rhythm before hitting the more intense rapids downstream. Then after a few Class III-IV rapids you come up to the Miracle Mile, a solid mile of Class V rapids where the river drops over 115 feet. But don’t worry, there’s still more to come…Rapids with names like Meat Cleaver and Power Popper are still awaiting you downstream. There is another three miles of breathtaking whitewater that will keep your knuckles white! And finally you will cap off the day with what we affectionately call the Cool-downs, a chance to take a breath and recollect on your wonderful day of whitewater. The Upper Yough is a truly unique experience! A bit of previous rafting experience is recommended. But if all you have is an adventurous personality, the Upper Yough could still be for you. And now is the time to book! We are offering a great special for a few May releases. 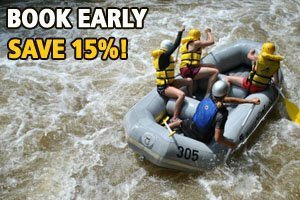 Raft on Friday May 9th or 16th, or Monday May 12th, for only $100 per person! Book online or Call 800-472-3846 now and mention coupon code UYSO to take advantage of this great deal! ← An Insider’s Look at Choosing the BEST River for White Water Rafting!